Planning for parking lot to serve Glassier takes shape. A planned trailhead at the corner of Hooks Lane and Hooks Spur Road, which will serve Glassier Open Space and the Rio Grande Trail, has taken shape on paper. So has a new path between the parking area and Glassier. Click the photo for more on this planning effort. Pitkin County is in the process of acquiring one acre at the corner of Hooks Lane and Hooks Spur Road to provide recreational parking for Glassier Open Space. County commissioners are expected to make a final decision on putting this parcel under contract on June 10. Then, the parcel will be subject to the Eagle County subdivision process, which will take about three months. Pitkin County would assume ownership in October. In the meantime, design work is under way for a parking lot at this site with the expectation that an unpaved parking lot would be created in 2016. At a May 29, 2015 site visit, equestrians and others looked at the potential for horse trailer parking at this lot, as well as on Glassier Open Space itself. No decisions were made. The minutes of the site visit meeting are posted here. Watch this site for further information regarding parking. RFTA soft Track from OST Truck and Trailer Parking area at the crossroads of Hooks Lane & Hooks Spur Road, and leading to the Crown Mountain Trail Head access, has been approved by RFTA for implementation staring this summer of 2016. Brett Meredith of RFTA Trails Department reported that the project was an improvement to an existing access point next to the RFTA existing parking area. The soft track will be a 4’ wide path of natural surface, and will be accessed for improvement to footing if necessary. The design phase for this project will start this spring, and construction will commence mid summer, using the same construction people who will be building the multi use (truck and trailer included) parking area mentioned above. Thank you Pitkin County OST, Gary Tennebaum, RFTA Trail Department, Brett Meredith and Staff, and RFTA Board! The equestrian community is excited the use of parking and soft track, and most appreciative of your consideration to preserve equestrian use in the Roaring Fork Valley. Thank you all so much for attending the Glassier site visit for the accommodation for equestrian truck and trailer parking. I have more understanding and great appreciation for your Pitkin County Commissioner and OST Staff and board member jobs. The task of balancing public wishes, preserving our environment, and making all governmental projects functional as well as beautiful is challenging. Both of you care deeply concerned about our valley and it’s residents, and I thank you for your efforts and time. The Roaring Fork Valley Horse Council is a non-profit 501 (c) (3) organization, with all of its’ members being volunteers. No one is being paid. We represent a community of people who have been disenfranchised over the last 10 years. The horse industry, our western heritage, and the local rural character of our valley are closely linked and generate a strong sustainable economy for the Roaring Fork Valley. We are in the process of putting the data showing the income generated by this industry for our economy. We are very appreciative of your consideration to provide parking so that horseback riders can enjoy riding the 9,100 acres on “The Crown”. We are disappointed that we cannot use the parcel C lot for this summer’s temporary truck and trailer parking. The bikers and hikers have parking at the RFTA lot across from Carrecarte, and have access to the Glassier -Crown Trail at this time. Brett Meredith said that the equestrians could use the small, RFTA parking lot at the busy confluence of Hooks Lane and Hooks Spur, and ride our horses down Hooks Spur Lane with traffic to the Glassier-Crown Access Trail. During the site visit, Bret Meredith indicated that soft track could be put in on the RFTA trail to link Carrecrate to the Glassier-Crown Trail. We met with Brett immediately following the site visit to discuss this possibility. He said although it was possible it would take years to implement, and he asked for the RFVHC to help acquire the money to achieve any unforeseen future soft tack in that area. Long story short, we would be riding down Hooks Spur Lane with traffic for an undetermined number of years. The Carrecarte parking area is a 1-acre area, which will be constrained to only one or two horse trailer spots, mixed in with the many cars for bikers, hiker, and anglers. The crossroads of Hooks Road, Hooks Spur Lane, and RFTA Rio Grande Trail and the heavily traveled Basalt trail system connecting to the Rio Grande, make this highly congested area. We are waiting for a new alternative design for the parking and safe soft track access to the Glassier-Crown Trail. Most equestrians no longer have the standard two horse rigs of the sixties and seventies, therefore a standard trailer size with a truck is 40 to 45 feet plus. The number of parking spots for truck and trailer parking should be equal to the cars spots for bikers, hikers, and anglers, some with boats. Each individual vehicle can accommodate multiple numbers of bikers, hikers and anglers. A truck and trailer for 3 horsemen is about 40 feet long. If you feel that you must put truck and trailer parking at the busy Carrecate acquisition property, then to be fair, you should put more parking at the brick house with overflow at Parcel C, if you are opposed to putting all the parking for horsemen on Parcel C. You have not identified one user group as having priority over another, so to be honorable you should provide equal parking for all. We are not asking for special consideration, we are asking for equal consideration. One horse trailer can carry 2 to 4 horses for 2 to 4 human riders. One car can carry 2 to 4 hikers or biker riders. Horses helped men settle the West, and horses are inextricably intertwined with our local Western Heritage. We are asking for equal user rights to help support the sustainability of our equestrian community. We want to set the record straight regarding the public process and steering committee meetings, which went on for a year. Leslie Thomas and I, Holly McLain, were on the Glassier Steering Committee, and went to all of the meetings as representatives of the equestrian community. Many wonderful things were accomplished. Recreational parking was not one of them. Parcel C and the Carrecarte parcel were identified as potential recreational parking. We expressed interest to be included in the Ag meetings, so that we could better understand the parcels and try to help implement some logical truck and trailer parking. We were not included in the Ag meetings. At this juncture the RFVHC made plans to become a joint partner with the Ag leaseholder on Parcel C, to insure truck and trailer parking. We decided not to pursue this action, but rather wait for the second reading of the Ag leases by the BOCC. Please see our attached time line of dates and meetings for truck and trailer parking. On May 29th we all met to look at the Glassier home site, the Parcel C, and the Carrecarte potential multi use parking. Steve Child requested a design study for the Carrecarte parking site. We understand why it is important to explore the potential for each proposed parking area. We look forward to seeing the design, but after looking at the site, we feel there would be great restriction and liability issues in such a constrained busy confluence and with no soft track for years, great exposure to accidents while riding down Hooks Spur Lane with traffic. The Glassier property should be an easy parking problem to fix. The Parcel C was traditionally used for trucks, trailers, haying and ranch machinery, and in the end turned into a bone yard. The Glassier family actively used their potato cellar and the parking area for their vehicles on Parcel C, because the river-bottom gravel base was sound and stayed dry. 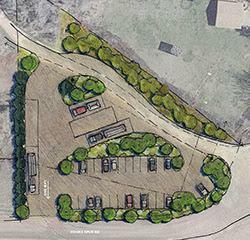 We think the Carrecarte lot improvements and the Glassier Ranch improvements will provide existing soil material to create a small berm on a short section along Hooks Spur Lane, and another short section of berm along the proposed Glassier Trail, which will shield truck & trailer parking from view. The berms could be planted with fruit trees, native grasses, or whatever vegetation is desired. This parking would only be in use during the short summer season. RFVHC strongly recommends Parcel C for truck and trailer parking. At the BOCC meeting on March 25th, for the 2nd reading for Ag leases the RFVHC, our RFH Pony Club members and other community members made a plea to have equestrian parking included in the legal AG lease language, on Parcel E around the house, but preferably on Parcel C. All leases were approved with the addition of language on leases for Parcel E & C, which specifically allows for truck and trailer parking. At that meeting Gary said there would be an up-coming Glassier site visit for the equestrians at Glassier. At the next OST board meeting we again asked for the promised equestrian parking site visit, and Steve & Rachel said they would like to be included. On May 4th, after receiving a notice from OST to: “Get Ready To Ride ” - The Crown opens May 16th. Carol Dopkin emailed Gary asking about her ability to park and ride, as she assumed that the notice was for all users. His email back to her stated that this was not the time and we would be included later. At our next BOCC meeting we pressed the site visit issue, and finally Gary was prompted to make the site visit happen. Please include the attached minutes from the Glassier, May 29th site visit for those who were not present to read. To further clarify the design of the parking area with respect to the number of spaces for cars, trucks and trailers. We wanted to point out that most vehicles carry 4 hiker-bikers, and each truck and trailer can carry, on average 3 horsemen. So, if you have a parking area designed for 30 cars that is potentially 120 hikers and bikers, and if you had only two truck and trailer spots, that would only service 6 horsemen. That is why we are asking for equal consideration when you are designing the parking spaces. On our last visit to Glassier on June 15th, for trail design with Mike Pritchard of the RFMBA and Gary Tennenbaum of OST, the RFVHC truck and trailer parked on parcel C, with full summer irrigation water flowing. Rory Cerise confirmed that this was the case. The Parcel C was dry and we had no trouble parking or turning our rig around to exit. We feel strongly the Parcel C is safe, solid, and ready to go for equestrian parking. Thank you for your time and sorry that the minutes and this comment were added after the fact.